It’s open-mic night and the comedy club at the corner is filled with laughs and people pretty much rolling on the floor laughing. The stand-up act tonight is brilliant! People can’t stop talking about the jokes they found hilarious. The faces are cheerful and the moods bright. The fans of comedy chit-chat around the buffet table, discussing in all seriousness, the ‘funny’ business. Exclamations are heard at the end of every sentence praising the magic of comedy. Laughter is indeed the best medicine, all concur. Plans are etched in stone to attend the next comedy night, right before the happy, beaming folks call it a night. Just then, a question raises its head. ‘How to get laughs when there’s no comedy event to go to?’ Television? Of course, television! It’s kind of a no-brainer—sitcoms and variety shows have long assumed the responsibility of destressing harried souls everywhere. But when the television show ends, and the stand-up wraps up for the night, the laughter disappears into the reality of life. What then is the antidote to the frown lurking at every nook and corner of life? It is laughing for the sake of laughing. Laughing without a joke, a quip or a dig. For these reasons and more, laughter yoga came into being and very quickly, morphed into a world movement. Dr Madan Kataria, the man behind this thought, the idea and its propagation, swears by laughing for no reason at all. In a freewheeling conversation with Soulveda, the doctor of happiness talks about the birth of laughter yoga, its journey into the world, and its evolution to its present avatar. At what point in your life did you begin to share a special connection with laughter? Laughing without any reason came as a revelation to me. As a young boy back in my village, I had never heard a joke. I didn’t know what a joke was. In village life, laughter came naturally to us. It’s like little children or two friends talking to each other and laughing. While living in the city, even the best of jokes didn’t crack me up. This is how I learnt we don’t always need a joke to laugh. Laughter yoga helps remove the baggage of the past. It is like a psychological release of emotions. When you laugh without a reason you become more mindful, flexible and open. Laughter has revolutionised the health of the world at large. Do you agree? Yes, it has. It’s widely understood and accepted now that laughter is a tool to manage stress and to improve the immune system. People get diseases when they don’t involve themselves in physical activities. Laughter solves this problem as it doesn’t rely on involving any physical activities. But we need to practise it every day. And, since the body cannot distinguish between fake and real laughter, it gets benefitted just the same. Laughter yoga also helps remove the baggage of the past. It is like a psychological release of emotions. When you laugh without a reason you become more mindful, flexible and open. How did your journey with laughter yoga begin? Back in 1993, I started a health magazine My Doctor to explore healing mechanisms that could work outside the scope of prescribed medicines. Ironically, the magazine business took a huge toll on my health. There was a lot of stress. So, I started looking for ways to destress myself. One day, I read ‘laughter is the best medicine’ and wrote an article about it. As I researched the subject, I found out about several benefits of laughing. I decided to start a laughter club, the idea of which most people rejected. But there were a few, including my wife who was interested in it. We started meeting early mornings at the park, telling jokes and laughing hysterically. The next day, 16 people came, after a week there were 50 people in the club. But then, we ran out of jokes. I told the club members I will come back with a solution. I read a book on emotions and health which said that when one acts happy, the body doesn’t know if it’s real or fake happiness. The next day I told everyone to start laughing without any reason. We all did, and the laughter was contagious. Within a month, we were around 90 of us laughing for no reason. We found that after the laughter exercise we would sweat as if after aerobics. We started including pranayama in our laughter exercises. Hence, the name laughter yoga. That group of five people has expanded to 106 countries today. Laughter yoga is the medium that can provide sustained laughter. My own sense of humour has improved with laughter yoga. For what kind of health issues does laughter strike as most effective to you? Cancer and depression are two main areas where laughter yoga works outstandingly. Oxygen is critical in healing cancer patients. If the body has enough oxygen, it can fight the cancer cells. And, laughing generates oxygen in the body. Cancer, just like snake bites, is fatal due to fear. The attitude matters just as much as the body’s functioning when it comes to overcoming cancer. And laughing helps us change our attitude and perception. Laughter takes you to the deeper places of the mind that also require silence. Anything else laughter does wonders for? Definitely! It has shown very good results with deaf and mute children. When we worked with children with such handicaps, there was a significant improvement in their speech just after a few classes. Laughter yoga is like a cardiovascular therapy that has the same effect as aerobics without needing much body movement. Where does laughter yoga stand in a world dominated by stand-up comedy and sitcoms, which are equally destressing. People often question the need for adopting laughter yoga in a world of sitcoms and stand-up comedy. To them, I want to say that the real benefits of laughing come from sustained laughter. Laughter arising from humour is not sustained. Also, jokes work differently for different people. Some would find a joke amusing and others may find the same boring. Laughter yoga is the medium that can provide sustained laughter. My own sense of humour has improved with laughter yoga. So, what lies ahead for the movement of laughter yoga? Soon, we will open our first Laughter Yoga University in Bangalore, where people can learn everything about laughter yoga. They can also live as a community. Laughing is easy when there are no problems. How does one laugh in the face of depression? My favourite quote is: “We don’t laugh because we are happy, we are happy because we laugh.” It’s not about feeling happy within, it’s about just laughing without a second thought. All my students have experienced a sudden shift in their mood after laughing without a reason. That’s how the mind works. We are the creators of our own happiness. Anybody can laugh in good times, but with laughter yoga we can laugh during tough times as well. Laughing every day early in the morning empowers us to fight the challenges of daily lives. Emotional empowerment is the biggest benefit of laughter yoga. 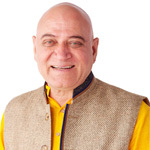 Madan Kataria is the founder of Laughter Yoga Clubs movement started in 1995. A doctor from Mumbai, he is popularly known as the ‘Guru of Giggling’ (London Times). A sought-after motivational and inspirational speaker, he shares the benefits of laughter with individuals and organisations across the world.